This Extension helps the administrator to add attribute values quickly and accurately, for all the languages installed in the system. A list of preset values can be defined for each attribute. 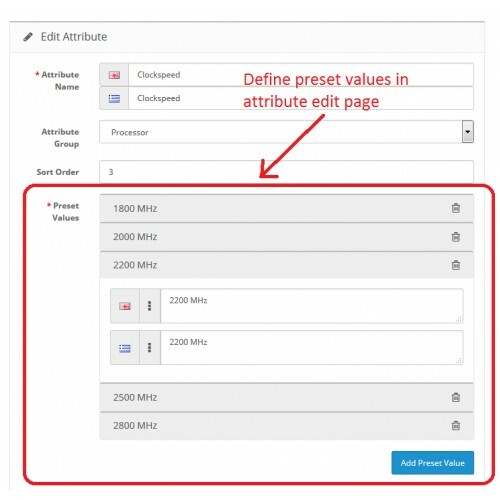 The preset values are then available in the “attributes” tab of product edit form. 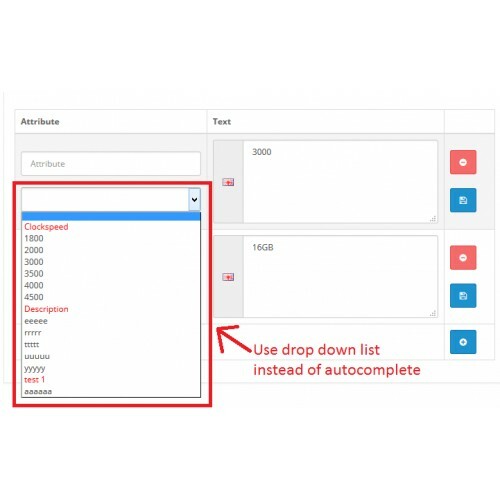 Using an autocomplete or drop down list, the user can select the values set for an attribute. 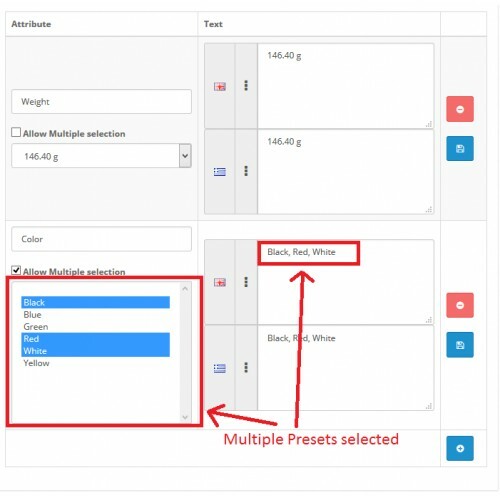 If no attribute is selected, the presets list can be used to set value and attribute with one step.If necessary, multiple presets can be selected to create an attribute with combined values. A new feature also allows you to create presets from the existing attributes already stored in your products. Latest version also allows you to define attribute templates that allow you to quickly add attributes to a product. Using preset values also guarantees that all products will have the exact same value in an attribute, making all filtering modules more accurate. This extension uses OCMod, so no system files are affected. - Define attribute templates to quickly add attributes to a product. 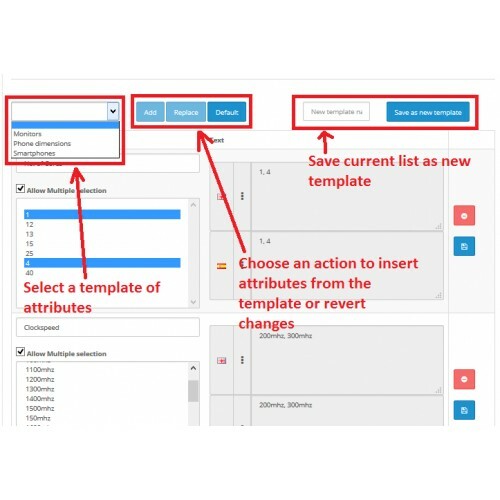 - Add to a product all the attributes of an attributes group. 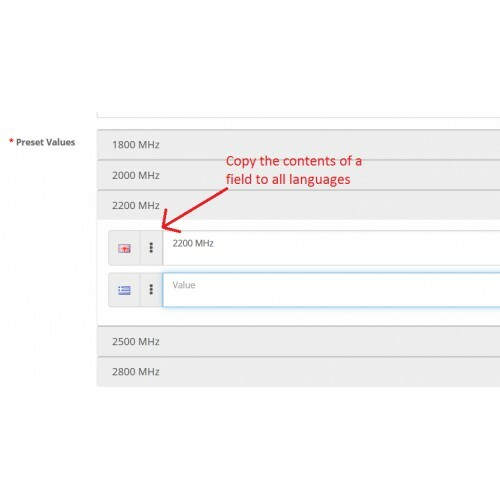 - Retrieve preset values in the product edit form for quick data insertion. - Multiple presets can be combined in a single attribute. - If no attribute is selected in an attribute row, you can select among all preset values. When one preset is selected, attribute and values are set at once. - Automatically update all related products when a preset value is updated. - Quick preset value insertion through the product’s attribute tab. - In version 1.1 you can use the presets autocomplete even in attribute rows that no attribute has been set. 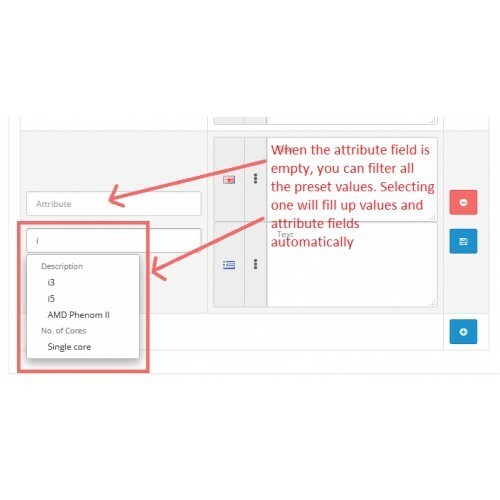 The autocomplete list will show values from all attributes and selecting one of them will set the attribute field along with the attribute's values. 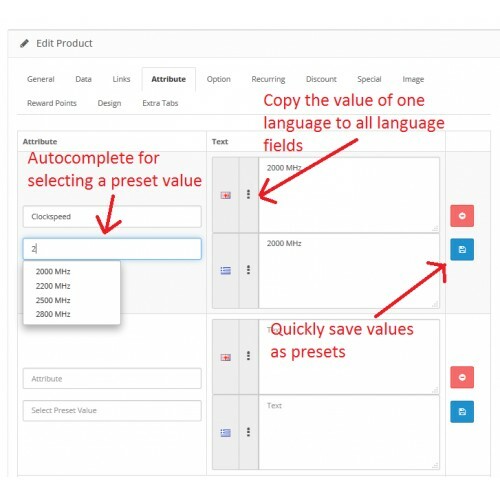 - In version 1.2 you can select presets in the product edit page using autocomplete or drop down list. - Fixed errors in autocomplete and special characters storing (text escaping). 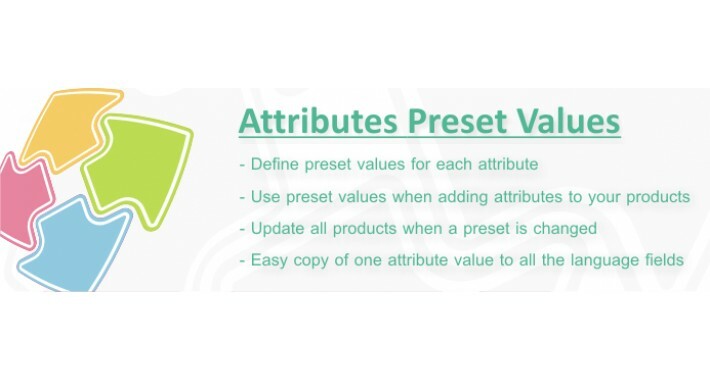 - You can select multiple presets into one attribute value. - Automatically create presets from the existing product attributes. - Multiple presets selection change. Attributes are saved in separate fields in order to allow filtering.